Before you decide to get tacos, you’ll need to know how many people to plan for. It’s best to know this going in so that you don’t get too far into the process and then realize you didn’t order enough food. You’ll want to overestimate a bit when it comes to the number of people. There’s nothing worse and more embarrassing than running out of food. It’s always better to have too much food than not enough, and who doesn’t love extra tacos?! Once you know how many mouths you’re planning for, you’ll need to know how much money you have to work with. Often, there are many different food options and price points, so once you know your budget, you can find the one that’s right for the amount of money you have available and the number of people you’re planning on. You’ll want to keep everyone happy and healthy, so be sure to determine well in advance if any guests have specific allergies or dietary restrictions. If some of the event attendees are gluten intolerant, for example, you’ll want to make sure there’s a gluten-free option (like corn tortillas). If you have a lot of vegetarians, you may consider ordering extra vegetables or greens so they can have a taco salad. Make sure you know this ahead of time so you aren’t scrambling at the last minute; sending a brief questionnaire to each of your guests well before the event will help here. Figure out how many kids you’ll have coming. Often, children can be picky and have a pretty limited palette. Consider including some tame options like simple quesadillas, or chips with mild salsa. Many children don’t like vegetables or foods that are too spicy. Keep it simple and plan for the little ones. Depending on the formality of the event, your food decisions may change. If it’s a simple family party, for example, some basic ground beef taco meat with a few toppings and some quesadillas might suffice. If you’re looking to fancy things up a bit, you may want to get some nicer meat (like steak), and offer more options beyond just tacos. Fajitas, burritos, or chimichangas might be good options. Some nicer taco places might even offer special fillings like shrimp, crab, or lobster. The most expensive taco in the world is priced at a whopping $25,000 and comes with a gold-infused tortilla, kobe beef, lobster, and black truffle brie. So if you’re looking for fancy, there are likely options available. If you’re planning on including a dessert, there are some great Latin American options to consider. If you want a cold treat with a twist, go for fried ice cream. Other great treats include fruit-filled and cinnamon-covered empanadas, rice pudding, flan, and alfajores. Take time to check out a menu and see if the provider offers some scrumptious desserts; they’re a fun way to enjoy another culture. Something to beware of when it comes to events is hidden fees. Some companies will charge a fee for serving the food to you. Others will allow you simply to pick the food up and serve it yourself. Interestingly, some companies don’t even let you keep the leftovers. Make sure you read the fine print so you know what you’re getting yourself into. 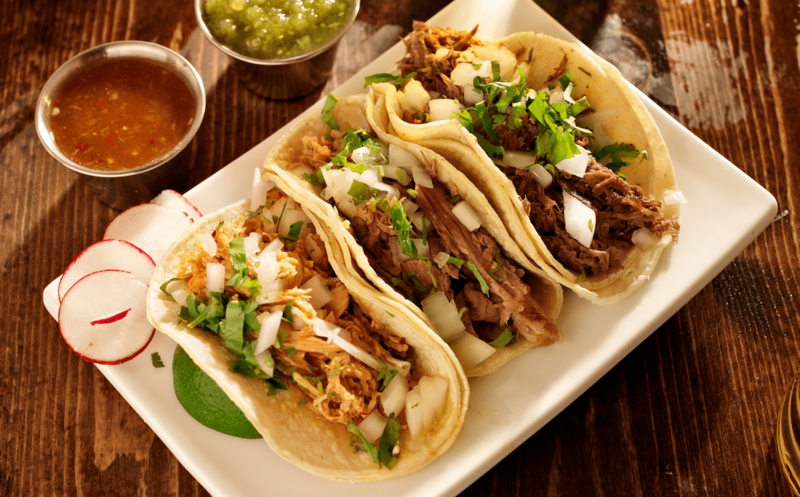 If you keep these considerations in mind, you’ll be well on your way to finding the perfect taco food option for your next event. Worry Free Catering is the best option for a Las Vegas caterer. Give us call at 702-825-6850 Best of luck!